As Jaguar introduces itself to the highly competitive CUV and SUV markets and experienced record breaking sales with the F-Pace, its easy to see why the E-Pace arrived so soon. Although JLR sales have been down worldwide recently, the E-Pace brings together high demand features in a smaller package that could reignite strong sales momentum. What the E-Pace delivers in performance is enhanced refinement and driving dynamics thanks to; aluminum chassis components, a torque balanced All Wheel Drive system, Active Driveline for optimized traction, All Surface Progress Control to tackle bad road conditions, two great powertrain options and configurable dynamics to personalize the entire experience. With enhanced driving dynamics and refinement, every journey is a pleasure in the E-PACE. Standard on the P300 engine, Active Driveline provides increased agility by optimizing traction and providing rear-wheel drive handling characteristics. The system allows up to 100 percent of rear axle drive torque to be distributed to either rear wheel, according to available grip. 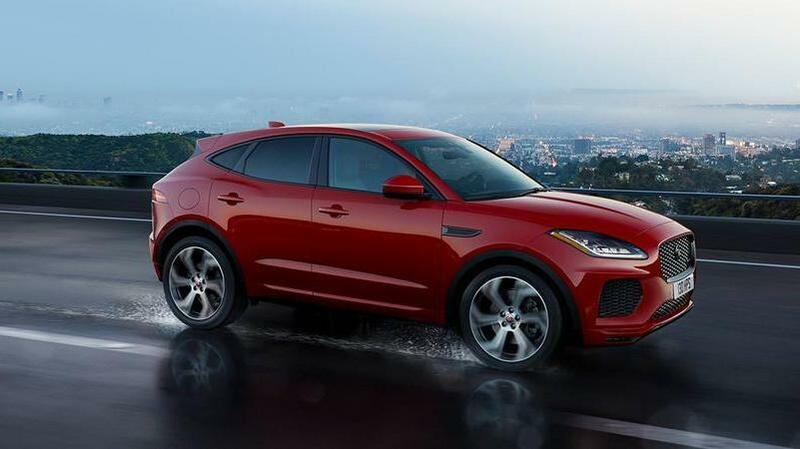 From power and sheer driving pleasure to fuel economy and refinement, there are two Ingenium engines available for the Jaguar E-PACE. Ensuring that you are always in the optimum gear, maximizing fuel efficiency and acceleration, the 9-speed Automatic Transmission in the E-PACE is highly responsive and smooth. Our low-friction, all-aluminum Ingenium engines have stiff cylinder blocks and twin balancer shafts to ensure inherently low levels of vibration, for smooth day-to-day performance. All engines are equipped with Stop/Start technology and smart regenerative charging ‑ harvesting kinetic energy while braking to charge the battery ‑ for maximum economy, especially during city driving. 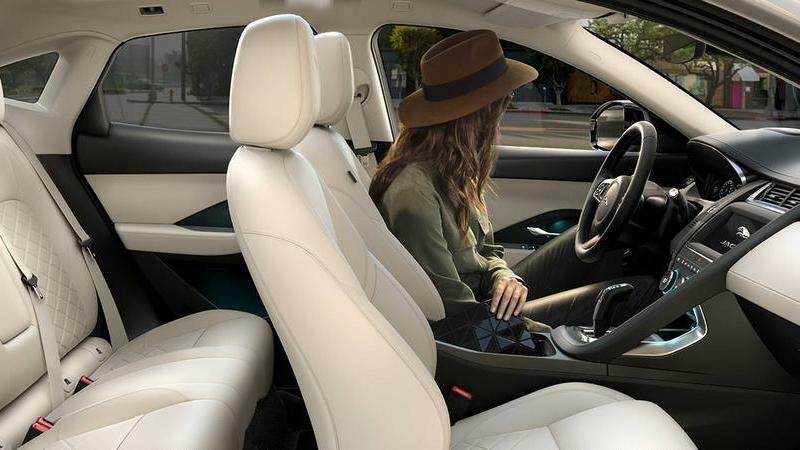 Ingenium gas engines in the E-PACE utilize cutting‑edge innovations, such as the Continuous Inlet Variable Valve Lift system, to enhance every aspect of performance and fuel economy and to help reduce CO2 emissions. Regardless of which trim you get, the E-Pace stands out from the rest with its unique take on design found throughout Jaguar's line-up. Ultimately expressing its level of sportiness and bold packing found all throughout. Most noticeable features are its honeycomb mesh grille, LED headlights, optional panoramic roof, and wheel options as big as 21". First Edition owners get to enjoy Auto-Dimming, Power Fold, Heated Door Mirrors with Memory And Approach Lights and Auto High Beam Assist (AHBA). LED headlights, Twin Tailpipes with Finishers, Chrome Side Vents, Grained Black Grille With Chrome Surround, Body-colored Bumpers and more all come standard. 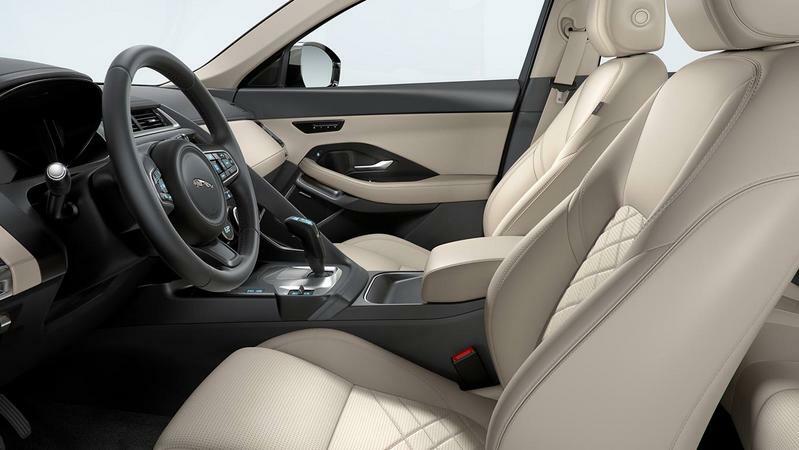 A range of wheel options are available to enhance the sporting character of the E-PACE. Choose from a wide selection of contemporary and dynamic designs in a range of sizes up to 21”*. On the inside a similar theme continues on, that is design you would only find in Jaguar products. Although not as cutting edge or futuristic looking, what you will find is a refined experience from placement of controls to convenient storage for all your needs. Complementing this is a number of premium materials and colors to personalize the cabin to your taste. Base owners can enjoy features like the Leather Steering Wheel, Center Console Cubby Box, Start-up Sequence with Movement, Dials and Lighting, Illuminated Metal Treadplates with Jaguar Script and more. As you move higher up the trims, features like an R-Dynamic Branded Leather Steering Wheel, Configurable Ambient Interior Lighting, Black Gearshift Paddles and an Auto-Dimming Interior Rear View Mirror become available. Anyone who has done their homework will know InControl isn't Jaguars strong point but won't discourage anyone content with the rest of the vehicle. 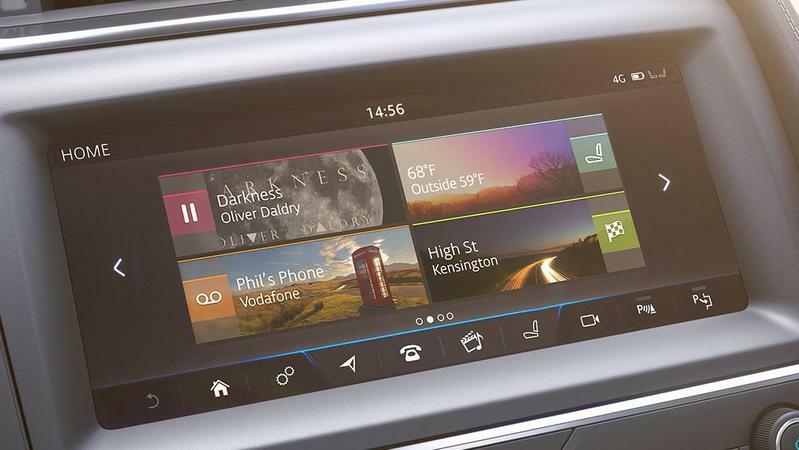 All we can hope is that Jaguar learns from car makers that lead in the infotainment department. If you still decide to get the E-Pace, Touch Pro comes standard (still buggy as reported in the F-Pace) along Navigation Pro, Connect Pro Pack, Smartphone Pack and Head-Up Display as you move up the trims. Convenience comes in the form of Dynamic Volume Control, Power Sockets, ECO Driving Style Assistant and Bluetooth® Connectivity. Audiophiles should look no further than the First Edition that comes with a Meridian Sound System that actually gets great reviews. Delivering a wealth of information and entertainment, InControl is our suite of advanced technologies that links both you and your E‑PACE to the wider world. InControl features intuitive and advanced integrated technologies to ensure everyone can make the most of their journey. The 10” Touch Pro screen at the heart of the center console supports swipe and pinch gestures and delivers rich audiovisual entertainment. Ensuring you’re always entertained, informed and connected, the E-PACE features an optional 12.3" high-definition Interactive Driver Display. The system can receive and project driving information, entertainment including navigation, phone and media. If you're like most buyers in this segment, practicality is likely near the top of your list and without a doubt, the E-Pace delivers. Activity Key free's you from the traditional key fob, Powered Gesture Tailgate for when your hands are full, up to 52.7 cubic ft of generous cargo capacity and Driver Assistive Features (Emergency Braking, Lane Keep Assist, Front/Rear Parking Aids, 360° Surround Camera, etc.) for safe and enjoyable driving. All of these features prove to be vital with the poor visibility, something no vehicle in this segment is immune to, shorter drivers can attest to this. Overall, the E-Pace is a good product that with the right refinements can be better over time. Senses when your vehicle is unintentionally drifting out of your lane and gently steers you back. I precisely took interest in the E-Pace because its a lighter version of the F-Pace. Drove my friends F-Pace and never liked how heavy they can feel in the turns. 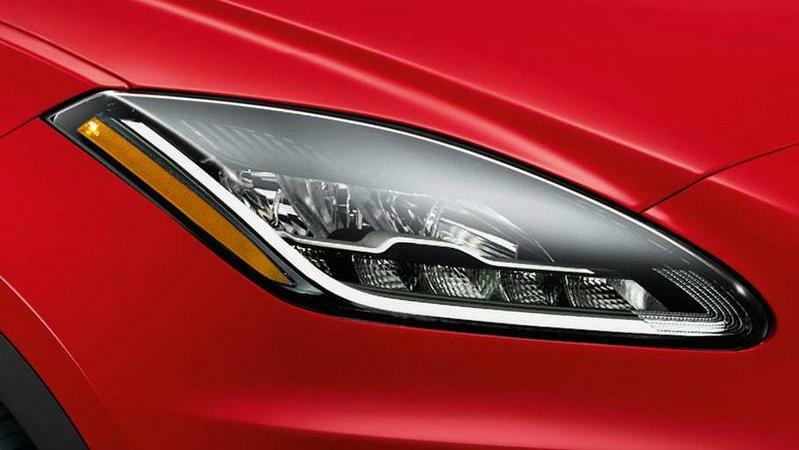 However, Jaguar has more chances to make it more on part with the Porsche Cayenne. Next step for the E-Pace needs to be a higher performing version. SVR?